St Patrick’s BNS is a primary school providing primary education to pupils from Junior Infants to Sixth Class. In accordance with the requirements of the Children First Act 2015, Children First: National Guidance for the Protection and Welfare of Children 2017, the Child Protection Procedures for Primary and Post Primary Schools 2017 and Tusla Guidance on the preparation of Child Safeguarding Statements, the Board of Management of [insert school name] has agreed the Child Safeguarding Statement set out in this document. The Deputy Designated Liaison Person (Deputy DLP is___Andy O’Rourke____________. In this school the Board has appointed the abovenamed DLP as the “relevant person” (as defined in the Children First Act 2015) to be the first point of contact in respect of the schools child safeguarding statement. This Child Safeguarding Statement was adopted by the Board of Management on _________________ [date]. Written Assessment of Risk of St Patrick’s BNS. In accordance with section 11 of the Children’s First Act 2015 and with the requirement of Chapter 8 of the Child Protection Procedures for Primary and Post-Primary Schools 2017, the following is the Written Risk Assessment of St Patrick’s BNS. Care of pupils with specific vulnerabilities such as pupils from minorities/migrants, members of Traveller community, LGBT children, and pupils perceived to be LGBT, pupils of minority religious faiths, children in care, children in CPNS. Visitors/contractors in school during school hours. Application of sanctions under School’s Code of Behaviour. The school has a yard/playground supervision policy to ensure appropriate supervision of children during, assembly, dismissal and breaks and in respect of specific areas such as toilets, changing rooms etc. This risk assessment has been completed by the Board of Management in February 2018. It shall be reviewed as part of the school’s annual review of its Child Safeguarding Statement. The Child Protection Procedures for Primary and Post-Primary Schools 2017 require the Board of Management must undertake a review of its Child Safeguarding Statement and that the following checklist shall be used for this purpose. The review must be completed every year or as soon as practicable after there has been a material change in any matter to which the Child Safeguarding Statement refers. Undertaking an annual review will also ensure that a school also meets its statutory obligation under section 11(8) of the Children First Act 2015, to review its Child Safeguarding Statement every two years. The checklist is designed as an aid to conducting this review and is not intended as an exhaustive list of the issues to be considered. Individual Boards of Management shall include other items in the checklist that are of relevance to the school in question. As part of the overall review process, Boards of Management should also assess relevant school policies, procedures, practices and activities vis a vis their adherence to the principles of best practice in child protection and welfare as set out in the school’s Child Safeguarding Statement, the Children First Act 2015 and the Child Protection Procedures for Primary and Post-Primary Schools 2017. Has the Board formally adopted a Child Safeguarding Statement in accordance with the ‘Child Protection Procedures for Primary and Post Primary Schools 2017’? As part of the school’s Child Safeguarding Statement, has the Board formally adopted, without modification, the ‘Child Protection Procedures for Primary and Post Primary Schools 2017’’? Has the Board reviewed and updated where necessary the written assessment of risk as part of this overall review? Are the relevant contact details (Tusla and An Garda Síochána) to hand? Has the Board arrangements in place to communicate the school’s Child Safeguarding Statement to new school personnel? Is the Board satisfied that all school personnel have been made aware of their responsibilities under the ‘Child Protection Procedures for Primary and Post Primary Schools 2017’ and the Children First Act 2015? Has the Board received a Principal’s Child Protection Oversight Report (CPOR) at each Board meeting held since the last review was undertaken? Since the Board’s last review, did each CPOR contain all of the information required under each of the 4 headings set out in sections 9.5 to 9.8 inclusive of the procedures? Since the Board’s last review, has the Board been provided with and reviewed all documents relevant to the CPOR? Since the Board’s last review, have the minutes of each Board meeting appropriately recorded the records provided to the Board as part of CPOR report? Have the minutes of each Board meeting appropriately recorded the CPOR report? Is the Board satisfied that the child protection procedures in relation to the making of reports to Tusla/An Garda Síochána were appropriately followed in each case reviewed? Where applicable, were unique identifiers used to record child protection matters in the Board minutes? Is the Board satisfied that all records relating to child protection are appropriately filed and stored securely? In relation to any cases identified at question 21 above, has the Board ensured that any notifications required section 5.6 of the ‘Child Protection Procedures for Primary and Post Primary Schools 2017’ were subsequently issued by the DLP? Has the Board ensured that the Parents’ Association (if any), has been provided with the school’s Child Safeguarding Statement? Is the Board satisfied that the ‘Child Protection Procedures for Primary and Post Primary Schools 2017’ are being fully and adequately implemented by the school? Has the Board identified any aspects of the school’s Child Safeguarding Statement and/or its implementation that require further improvement? Has the Board put in place an action plan containing appropriate timelines to address those aspects of the school’s Child Safeguarding Statement and/or its implementation that have been identified as requiring further improvement ? Has the Board ensured that any areas for improvement that that were identified in any previous review of the school’s Child Safeguarding Statement have been adequately addressed? *In schools where the ETB is the employer the responsibility for meeting the employer’s requirements rests with the ETB concerned. In such cases, this question should be completed following consultation with the ETB. Note: Where a school is undertaking its first review, references in this checklist to the “last review” shall be taken to refer to the date on which the Child Safeguarding Statement was first put in place. The Board of Management’s annual review of the school’s Child Safeguarding Statement was completed at the Board meeting of _______________ [date]. The Board of Management of St. Patrick’s B.N.S. has prepared a new draft enrolment policy in accordance with the provisions of the new Education (Admission to Schools) Act, 2018. The Board of Management of St. Patrick’s B.N.S., hereby details the enrolment policy of the school as of 3rd October 2018, revising the November, 2017 policy. This is in accordance with provisions of the Education (Admission to Schools) Act 2018. St. Patrick’s B.N.S. is a Catholic primary school, under the Patronage of Archbishop Diarmuid Martin. It caters for boys only from Junior Infants to 6th Class. As a Roman Catholic School, the school aims to promote the full and harmonious development of all aspects of the pupil; intellectual, physical, cultural, moral and spiritual, including a living relationship with God and other people. The school models and promotes a philosophy of life inspired by belief in God and in the life, death and resurrection of Jesus Christ. The Catholic school provides religious education for the pupils in accordance with the doctrines, practices and tradition of the Roman Catholic Church and promotes the formation of the pupils in the Catholic Faith. Its Board of Management comprises representatives of parents, teachers, the trustee and the local community. There are 10 teachers in the school, including the Principal. We have six mainstream teachers and three SEN teachers. We share a Home School Community Liaison Teacher with St. Patrick’s G.N.S. and Ringsend College. We have one SNA. Inclusivity (particularly with reference to children with disabilities or special educational needs). Equality of access and participation in the school. Respect for the diversity of values, beliefs, traditions, languages and ways of life in society. Parental rights to enrol their children in the school of their choice; this in the context of the existing school community and the rights of the pupils already enrolled. Boys of the parish/local area and siblings/step/half-siblings of children already enrolled in St. Patrick’s B.N.S. and St. Patrick’s G.N.S. – priority to eldest. Boys who live outside the locality including sons of staff members – priority to eldest. The Board of Management will not regard the residency requirement as satisfied unless the parents/guardians have provided proof as required by the Board of Management, of residence in the parish as at the closing date for applications and for a period of three months prior to that date, and intend to continue to reside in the parish up to and after the start of entry to Junior Infants. The Board of Management reserve the right to withdraw an allocation of a place that has been allocated on the basis of residence in the parish at any time prior to the commencement of the relevant Junior Infant class in the school if the Board is satisfied that the applicant is no longer residing in the parish, regardless of whether the applicant was residing in the parish at any time before then. Providing false or misleading information or withholding relevant information will invalidate an application. The Board of Management reserves the right to amend any aspect of the above as may be deemed necessary. Junior Infants must be 4 years of age by September 1st in the year of entry (but we would recommend that boys be 4.5 years or older when starting school). Parents wishing to enrol their children in this school should, in the first instance, make contact with the Principal. A completed Enrolment Application form must be received within the dates specified by the relevant application form. A letter of acknowledgement of receipt of the application form must be kept as proof of application. All applications received by midday, January 15th of the year of entry, will be considered in accordance with the enrolment procedure outlined above and parents will be notified regarding places within 21 days of the closing date. Should the number of applications received exceed the number of places available, a waiting list will apply. Applications received after the closing date (midday, January 15th) will be placed on either a Criteria 1 waiting list or a waiting list for Criteria 2-3 applicants. Places will be offered in order of age within these categories. Parents will be required to provide details of their child’s name, age and address, religion, previous education, special educational needs and any medical needs as well as other information required by the Pupil Online Database. Birth certificate and proof of address must be submitted. Baptismal certificates may be requested from Catholic pupils. In the case of a child with specific special educational needs, the B.O.M. may request copies of medical and/or psychological reports in order to assess the school’s ability to appropriately provide for the education of the child. In such cases, a meeting will be held with the child’s parents and all personnel involved in the care of the child. The purpose of the meeting will be to discuss the needs of the child and to profile the support services required. Following this meeting and on receipt of all relevant reports, the B.O.M. will assess how the school can meet the needs identified. Application may be made to the Special Educational Needs Organiser for additional resources if appropriate. Pupils may transfer to the school at any time, subject to the above, and in some cases, subject to the prior approval of the D.E.S. As a result of change of address, children will be accepted into the school at any time depending on availability of places. Assuming that there are places available in the requested classes, an Application Form may be completed at this time. Application forms are available from the school office, by email or by post. Application forms may be completed and submitted at any time during the school year. Completion of an Application Form does not automatically entitle an applicant to a place. If transferring from another school, it is school policy that the Principal of St. Patrick’s B.N.S. will make contact with the Principal of that school, prior to the offering of a place. Refusal to Enrol: The BOM reserves the right to refuse enrolment in exceptional circumstances if, in the opinion of the BOM, there is evidence of an unacceptable risk to other pupils, school staff or school property. Children enrolled in our school are required to co-operate with and support the school’s policies including policies on Code of Behaviour, Curriculum, Organisation and Management. The B.O.M. places responsibility with Parents/Guardians for ensuring that their child/children co-operate with said policies in an age-appropriate way. Parents must give a written undertaking to sign up to the school’s code of behaviour. Appeals: Where a Board of Management refuses to enrol a student in a school, the parents has a statutory entitlement under Section 29 of the Education Act to appeal that decision to the Secretary General of the Dept of Education & Skills. The ethos of our school establishes and supports a strong sense of community within the school between School staff, Board of Management and Parents/Guardians. A mutual relationship of respect should be cultivated between staff, children and parents/guardians. As a staff, our aim is to create a happy, secure environment for all our pupils, within which there is a sense of good order, effective teaching and an agreed approach to discipline. We aim to ensure that we accommodate the individuality of each child while at the same time acknowledging the right of each child to education in a relatively disruption free environment. I will be gentle – I will not hurt anyone. I will be kind and helpful – I will not hurt people’s feelings. I will be honest – I will not hide the truth. I will listen – I will not interrupt. I will look after property – I will not waste or damage things. I will work hard – I will not waste time. I will be on time – I will not be late for school. I will wear my uniform. I will be responsible for my personal hygiene. I will always treat people with respect. The emphasis in our school is always on the positive. Our catch phrase is: Catch them when they’re being good! I will sit on my chair when requested to do so and do my work to the best of my ability. I will listen and I will let others speak. I will walk and not run. I will help keep the room tidy. I will use the toilet properly and always wash my hands. I will be kind and helpful and not hurt other people’s feelings. I will listen to and obey the teacher. Good behaviour will be rewarded and praised. Unacceptable behaviour will not be tolerated. The following are the sanctions which may be used to show disapproval of and discourage unacceptable behaviour. Gestural warning: a look, nod or whisper. Time out: Removal to another classroom. Written punishment to be done at break-time or at home. I will walk quietly in my line to and from yard. I will let others join in games. I will be gentle. I will not kick, push, or punch. I will not use bad language or call people hurtful names. I will stay in view of the teacher at all times. I will not retrieve balls without teacher’s permission. I will not climb on walls or basketball hoops. I will walk quietly to my line when I hear the bell or when instructed to do so by the teacher on yard. I will always walk quietly and never run. I will let adults pass. I will always hold the railing when walking on the stairs. I will not push or shove when in line. Positive attitudes must be constantly encouraged by all teachers. Teachers promote models of good behaviour. Remind children of the rules and rationale behind them. Reward children who have difficulty behaving well when they are good. Assemblies to reiterate rules and praise good behaviour. Class privileges such as movie time, extra football, quiz, extra computer time. All minor misdemeanours when on a continuous basis. Our ideal is that our pupils acquire the skills of self-discipline. Circle Time/ Class Assembly to address issues and resolve conflict. Parents are called in for meeting. Relevant assessments may be sought. A shortened day may be decided upon. Board of Management may be informed. Where these steps have been carried out and the problem still remains, the Principal, in consultation with the B.O.M. and Staff, may take a decision to suspend a child. This would be carried out under Rule 130 (5) of the Rules for National Schools. Outside agencies such as NEPS, The Health Board or the Gardai may also be contacted. Where there is a serious/grave problem and should the welfare of other children or staff be at issue, placement in another school, more appropriate to his needs, may be sought/recommended. *This document will be reviewed yearly and is subject to change. The school enforces a healthy lunch policy. This is in order to promote a healthy lifestyle and to combat childhood obesity and other conditions brought on by the consumption of unhealthy foods. Sandwiches, fruit, water and milk are provided for each child in the school. Water, Milk, Some Fruit Juices. Reminder: No food items containing traces of nuts are allowed in school due to allergies. “A protected disclosure means disclosure of relevant information, which in the reasonable belief of the worker, tends to show one or more relevant wrongdoings and which came to the attention of the worker in connection with his/her employment”. In making a disclosure a worker must reasonably believe the information disclosed to be substantially true. No worker will be penalised simply by getting it wrong so long as the worker had a reasonable belief that the information disclosed shows, or tends to show, wrongdoing. The above Act came into effect on the 16th of July 2014. Schools are required to put a Protected Disclosure policy in place which meets the requirements of the Act. The Board of Management of XXXXXXX. takes the issue of wrongdoing seriously and as a result has drafted this policy. The commission of an offence. Danger to Health & Safety of an individual. Improper use of public funds. The relevant wrongdoings may already have taken place, be happening or be likely to happen. Who is a Worker as far as a school is concerned? Individuals on work experience pursuant to a training course and trainees of/with the school. To whom do you make the Disclosure? The vast majority of disclosures should be made, orally or in writing, to the school Principal or to the Chairperson of the Board of Management (BOM). Where this is inappropriate or impossible there is provided a list of “Prescribed Persons”. In relation to schools the Prescribed Person is the Secretary General of the Department of Education and Skills (DES). What protections are available to whistle blowers (Disclosers)? Up to 5 years’ remuneration for unfair dismissal. Protection from penalisation by the school Board of Management. If you as a member of staff have a genuine or reasonable concern that there is wrongdoing in the school you should report it to the Principal. If this is not appropriate or possible you should then report it to the Chairperson of the BOM. Workplace grievances should be reported in the normal manner and are not covered by this policy. It should be noted that while internal reporting is encouraged you have the option to raise concerns outside of the school’s Board of Management and report to the Secretary General of the DES. St Patrick’s BNS is committed to protecting the identity of the worker making a protected disclosure and ensuring that protected disclosures are treated in confidence. However, there are circumstances, as outlined in the 2014 Act, where confidentiality cannot be maintained, for example, where the Discloser makes it clear that he/ she has no objection to his or her identity being disclosed and/or the identity of the Discloser is critical to an investigation of the matter raised. If it is decided that confidentiality cannot be maintained in the context of an investigation, the school will inform the Discloser in advance that his /her identity will be disclosed. This policy was recently formulated by Staff and Board of Management of St. Patrick’s BNS. The purpose of the policy is to identify the records required to be retained by the school and to ensure confidentiality and manageable procedures in relation to access to such records by parents and stake holders. A policy on data protection and record keeping is necessary to ensure that the school has proper procedures in place in relation to accountability and transparency. It is good practice to record pupil progress so as to identify learning needs. -Education Act, Section 9g requiring a school to provide access to records to students over 18/parents. -Education Welfare Act – requiring a school to report school attendance and transfer of pupils. St. Patrick’s BNS promotes openness and co-operation between staff, parents and pupils as a means towards providing the caring environment through which a child can develop and grow to full potential. To ensure the school complies with legislative requirements. To clarify the types of records maintained and the procedures relating to making them available to the relevant bodies. To put in place a proper recording and reporting framework on the educational progress of pupils. To establish clear guidelines on making these records available to parents and pupils over 18. To stipulate the length of time records and reports will be retained. The principal assumes the function of data controller and supervises the application of the Data protection Act within the school. The data under the control of the principal comes under the following headings. This data relates to personal details of the students such as names, address, date of birth, gender, ethnic origin, nationality, religious belief, medical details, dietary information, PPSN. It does not include parent and guardians details. Student records depending on their sensitivity are held by each class teacher, the learning support teacher or principal. There is a safe in the office for what is judged to be very sensitive. Phone numbers are available in the office of course. Personal details of the student i.e. Enrolment form in filing cabinet in office. School report cards are kept locked in filing cabinet in office. Psychological Assessments if any are kept in the safe in the office. Standardised Test Results in the learning support teacher’s filing cabinet. Attendance Records are kept by the teacher. Screening Test such as MIST and NRIT in the learning support teacher’s filing cabinet. Teacher – designed tests. Each class teacher designs his/her own test template. Diagnostic Test Reports in the learning support teacher’s filing cabinet. Individual Education Plans are kept by relevant teacher. Learning Support/Resource Data such as records of refusals to allow children access to LS/RT services in the school kept by principal. Portfolios of student work e.g. Art kept by teacher. Staff Data – name, address, date of birth, contact details, payroll number, pension details, attendance records, qualifications, school records, etc, are kept in safe in the office. Attendance Reports, Roll Book, Registers kept in office. Accident Report Book kept in office. Administration of Medicines Indemnity Form kept in office. A Parental authorisation form must be completed by parents in the event of data being transferred to outside agencies such as health professionals etc. Outside agencies requesting access to records must do so in writing giving seven days’ notice. Parents/Guardians can make such a request either by phone or in writing. A standardised school report form is used which is issued in the last week in June. Records are kept for a minimum of seven years, Standardised tests booklets are shredded after one year but the raw score, stens and percentiles are kept on record until past pupils reach adulthood. A pupil profile is held by each teacher in his/her individual classroom and passed on to the next teacher as the child moves to the next class. As children pass to second level their personal records are stored in the school attic for a period of time (7 yrs minimum). All completed school roll books are stored in a similar location in addition to samples of children’s work and pupil profiles. Access to these stored files is restricted to authorised personnel only. For computerised records, systems are password protected. Compliance with Data Protection Act and Statue of Limitations Act. Framework in place for ease of compliation and reporting. The school staff, under the direction of the Principal will implement and monitor this policy. Individual teachers will design, administer and record all in-class testing. The Principal will ensure records are maintained and stored, particularly the records of students transferring to another school. This new policy is effective from November 2017. All records held from before that date will continue to be maintained in the school files. This policy was ratified and communicated in February 2008. It will be reviewed at the beginning of each school year and amended if necessary. This policy was formulated by Staff and Board of Management of _________ School. The purpose of the policy is to identify the records required to be retained by the school and to ensure confidentiality and manageable procedures in relation to access to such records by parents and stake holders. Education Welfare Act – requiring a school to report school attendance and transfer of pupils. Our school promotes openness and co-operation between staff, parents and pupils as a means towards providing the caring environment through which a child can develop and grow to his full potential. This data relates to personal details of the students such as name, address, date of birth, gender, ethnic origin, nationality, religious belief, medical details, dietary information, PPSN, contact details and parents’ names. These are kept in a locked filing cabinet. Student records are held by each class teacher and a master copy is held in Principal’s office. Details of behavioural incidents or accidents. This data relates to personal and professional details of the Staff such as name, address, date of birth, contact details, payroll number, attendance records, qualifications, school records, sick leave, CPD, curriculum vitae, school returns, classes taught, seniority and supervision payments. First and second-level schools (where relevant). A parental authorisation form must be completed by parents in the event of data being transferred to outside agencies such as health professionals etc. Outside agencies requesting access to records must do so in writing giving seven days notice. Parents/Guardians can make such a request either by phone, email or in writing. The right to erasure or rectification is available to change any mistakes or inaccuracies by proper authorisation through the same procedures. The Annual School Report format and its communication to parents are outlined clearly in our schools Report Form Guidelines Policy. A standardised school report form is used which is issued by post in _______. All records are stored in the school for a minimum of 7 years until the past pupil reaches the age of 21. These records are stored in office in a locked filing cabinet. A pupil profile and selection of records are held by each teacher in his/her individual classroom and passed on to the next teacher as the child moves to the next class. All completed school roll books are stored in a similar location in addition to samples of children’s work and pupil profiles. Access to these stored files is restricted to authorised personnel only. Computerised records, systems are password protected. This new policy is effective from 2017 November. All records held from before that date will continue to be maintained in the school. This policy was ratified in November 2017. The policy will be available on the school website and through the office. It will be reviewed every 2 years and amended if necessary. This anti-bullying policy operates in conjunction with the Code of Behaviour, which is used to address isolated instances of anti-social behaviour. The school has a central role in the children’s’ social moral development just as it does in their academic development. In school, we work towards standards of behaviour based on the basic principles of honesty, respect, consideration and responsibility. The individuality of each child needs to be accommodated while at the same time acknowledging the right of every child to education in a disruption free environment. Bullying is defined as repeated aggression, whether verbal, psychological or physical, conducted by an individual or group against others. Examples of bullying include physical aggression, damage to property, intimidation, isolation, name-calling, taunting or ‘slagging’. Child to child bullying, teacher to child, intra staff bullying, parent to staff and parent to child bullying (including a child other than their own) are examples of the areas where bullying may occur. Isolated instances of aggressive behaviour, which would be dealt with under the Code of Behaviour, would not be described as bullying. However when the behaviour is systematic and ongoing, it is bullying. The school acknowledges that there are three parties involved in bullying – those who bully, those who are bullied and those who witness the bullying. Staff and teachers bear this in mind when dealing with bullying incidences and try to support and work with all parties involved. Prior to a record of incidences being kept, parent(s) will be informed. Should the action taken at this stage prove not to have resolved the issue, the staff will proceed to stage two. The Principal will arrange to meet with the parents of the child who is seen to be bullying and separately with the parents of the victim of bullying. The children themselves may be required to attend part or all of these meetings. The child who is bullying will be placed on report. This means that the child’s behaviour in all areas is monitored during the day. The child has three meetings with his teacher and together they decide on what is to be written for that part of the day. All positive behaviour, progress on work etc will be noted. At the end of the day, the teacher writes his own comment. The purpose of this report to focus as much as possible on the positive qualities and efforts of the child, and to motivate the child to move away from negative behaviour. The child should be able to see that parents and school are working together in his interest, so the co-operation of the parents is essential. Initially a review of the reports will be carried out on a weekly basis, in a meeting with the Principal, teacher, parents and child. If progress is being made, longer intervals between meetings may be decided upon. The child who is the victim of bullying will also meet with the Principal and his/her parents. The aim of such a meeting(s) will be to address emotional needs and devise strategies for the child to deal with the bullying. This may involve reinforcing the programme being covered in class, or other strategies. It is the duty of the school to provide a safe environment for all the children. Should the above interventions fail and the bullying continue, a programme of appropriate sanctions may be implemented by the Principal in consultation with the parents and Board of Management. Sanctions implemented aim to encourage positive behaviour and support the esteem of the child. These sanctions may include a period of suspension during which there will be ongoing consultation with the parents to decide on appropriate action(s) to be taken in the best interests of the child. Suspension for any period of time will be reported in writing by the Principal to the Chair of the Board of Management. In the case of intra-staff bullying, St. Patrick’s B.N.S. Ringsend will adopt the procedures outlined in Section C (c2) of the INTO booklet: ‘Working Together: Procedures and Policies for Positive Staff Relations’. A copy of this document is available for free download on the INTO website. In the case of Teacher – Child bullying, a complaint should in the first instance be raised with the teacher in question by the parent/guardian of the child if possible and then if necessary referred to the Principal. Where it has not been possible to agree a framework for resolution, the matter should be referred in writing by both parties to the Board of Management for investigation. In the case of Parent – Teacher bullying, the Principal should be informed in the first instance, and if deemed necessary the Board of Management should subsequently be informed in writing. In the case of Parent/Visitor to the school – Child bullying, the complaint should be referred in the first instance to the child’s class teacher and subsequently to the Principal if unresolved. In the case of Principal – Parent/ Child bullying, the matter should be raised with the Principal if possible, or referred to the Chairperson of the Board of Management. #The following section has been added to the policy in Autumn 2017 as per IPPN guidelines. Bullying can mean many different things. Bullying can take many forms, but its aim is always to make a person feel upset, intimidated or afraid and if this happens again and again it is bullying. being forced to hand over money or possessions. There are a lot of reasons why some people bully. They may see it as a way of being popular, or making themselves look tough and in charge. Some bullies do it to get attention or to get something, or to make other people afraid of them. Others might be jealous of the person they are bullying. They may even be getting bullied themselves. Some people who bully may not even understand how wrong their behaviour is or how it makes the person being bullied feel. Why are some young people bullied? Some young people are bullied for no particular reason, but sometimes it’s because they are different in some way – perhaps it’s the way they talk, their size, their looks, their name or just because they are very good at something. Sometimes young people are bullied because the bullying person thinks they won’t stand up for themselves. Boys were found to engage in three times as much bullying as girls. Research found that the popular belief that children who bully feel insecure and anxious inside is NOT true. In fact, children who bully have a low level of anxiety. The typical child who bullies has ‘an aggressive personality pattern’ combined, at least in boys, with physical strength. The factors which were found to help create an aggressive personality problem were: negative emotional attitudes of the primary caretaker characterized by lack of warmth, permissiveness by the primary caretaker for the child’s aggressive behaviour, use of ‘power-assertive’ child rearing methods such as physical punishment and the child’s temperament. (If this document is for pupils as well as teachers I’d simplify the language in this paragraph completely). If you’re being bullied what can you do? Always remember – It’s not your fault! It’s the bullying person who has the problem, not you. Don’t put up with bullying. Ask for help. Believe in yourself. Don’t believe what the bullying person says of you. You know that’s not true. Check out your body language. Practise walking with confidence, standing straight with head held high and taking deep breaths. Practice assertiveness. Stand tall, look the bully in the eye, breathe steadily, speak calmly and firmly. This can help you to feel stronger, and also makes you look more confident. Don’t suffer in silence – talk to someone you trust. It always helps to share a problem and to know that you are not alone. In schools and clubs, adults in charge have to pay attention to any complaints you make about being bullied. If an adult is bullying you, then look for help from another adult you can trust. You have rights, and you must insist on them. There are rules and procedures to deal with adults who bully at home, in school, in sport clubs and where people work. If you are too nervous, take along a friend. Choose when to resist. Sometimes the only sensible thing to do is to give in. Just get away and tell someone. Try not to use violence. It never solves anything, and usually just makes the situation worse. Keep a diary. Keep a record of details – who, where, when, how – as this will make it easier for you when you tell your story. Have an answer ready. Well chosen words can often make a bullying person look foolish, and that’s the last thing they want! Try not to show you are upset or angry (even if you are). Reacting to the bullying person is only giving them what they want. If there’s a gang involved try to approach each person on their own, rather than when they’re together. If you talk straight to them, you’ll probably find that they’re not so confident without the protection of the group. Ask your friends to support you. People who bully don’t like being outnumbered or isolated. Try to make new friends if the ones you have at the moment seem to enjoy trying to make you feel bad. Change your routine. Try to avoid being on your own in places where you are likely to be picked on. Have you ever hurt someone on purpose? Have you ever used your size or strength to win against someone weaker? Do you repeat rumours, even if you’re not sure they’re true? Have you ever tried to turn your friends against someone? Have you ever watched others bullying someone without doing anything to stop it? Have you ever used the excuse ‘I was only messing’ when you knew you weren’t ‘only messing’? If answering these questions made you feel uneasy, maybe you should look at the way you treat other people. Talking to someone always helps. Choose a trusted friend or maybe one of the organisations listed in this booklet. Remember that bullying is always wrong – feeling good shouldn’t mean having to make someone else feel bad. As an adult, what are the signs I should look out for? One of the most terrible effects of bullying is that the bullied child will very often deny that it’s happening. It’s important that you don’t put even more pressure on a child who may be bullied. Forcing someone to tell when they don’t want to can itself be a form of bullying. But there are certain signs to look out for if you have suspicions. Happy at the weekend but not during the week. A drop in performance in school. Signs of regular interference with personal property, books, etc. Frequently asking for (or perhaps stealing) money. Although these can also indicate problems other than bullying, it’s important that you don’t ignore them. Try to encourage the child to talk about what’s going on, either to you or to another trusted adult. Once they begin to discuss the bullying, it may seem to be all they can talk about. Be patient and let them go on – it’s better for them to let it all out than to bottle it up. Believe the victim. No one should have to put up with bullying. Seek advice from an individual or a support group with experience in this area. Discuss bullying openly and regularly with your children – don’t wait for them to raise the issue. Thank the child for disclosing the problem. Confidence is the first casualty of bullying, so let your child know you believe them and will support them. Tell them it’s not their fault. Listen carefully. Don’t rush the story. Show you are concerned and sympathetic. Get all the details – what, who, when, where, etc. Write down the details and check the information with your child. This will be important for any meetings which may come later. Take action. Don’t wait to see if it all blows over. Bring your information to the relevant authority, and insist on getting an adequate response. Speak to an appropriate teacher as soon as possible. Think about asking someone to accompany you for support. Don’t exaggerate. Be honest and stick to the facts as you understand them. Use your notes to make sure you don’t forget to mention any important points. Recognise that you may be upset when you speak to the teacher. Accept that your child may not have told you all the facts, and that there may be another side to the story. Ask for a copy of the school’s policy on bullying. Find out what action the school intends to take. Arrange for a follow-up meeting with the teacher to measure any improvement in the situation. After the meeting, you may wish to make a note of what was agreed and send a copy to the teacher. If you are not happy with the teacher’s response, make an appointment to see the principal. If you still feel dissatisfied having talked to the principal, contact members of the Board of Management who are there to represent your interests. Remember to keep copies of all letters you send and receive. If your child is happy to have you attend, you can request that all interviews with him or her on this issue are conducted in your presence. If the problem persists, then you should consider moving your child to another class or even another school if this is possible. You should consider carefully whether further aftercare is needed following a move to another class or school. How can I tell if my child bullies others? Although these can also indicate problems other than bullying, it’s important that you don’t ignore them. Try to encourage the child to talk about what’s going on, either to you or another trusted adult. What do You know about Bullying, Pete Sanders, 2000 – Aladdin Books Ltd.
Teachers in this school will usually make themselves available for brief consultations or to answer any brief queries from parents without the need for a prior appointment. However, if a parent seeks a more formal or lengthy discussion or wishes to make a complaint or air a grievance, the parent in question should make an appointment with the teacher through the School Principal. A Teacher cannot adequately supervise his/her class while speaking to a parent at the door. It is difficult to be discreet with so many people within earshot. It can be embarrassing for a child to see his parent/guardian talking to his teacher at the door of the classroom. In a case where a teacher feels threatened/frightened/intimidated when dealing with a parent he/she should walk away and immediately report the incident to the Principal. If a parents wish to drop in lunch-boxes or sports gear etc. they should not disrupt the class. Instead, the items in question should be left at the Principal’s office. A written note may also be used to communicate between parents and teachers. Parents/Guardians are responsible for their children until they are collected from their class line at 8.50am by their teacher. Parents/Guardians collecting children at 2.30pm are asked to remain in the yard and leave the space between space for the children leaving the school. This does not apply to the Junior and Senior Infants leaving at 1.30pm. Parents/Guardians must not enter the school building prior to 8.50am. Unless parents/guardians need to speak to the teacher/principal there is no need to walk the child to classroom. In order to cultivate independence, children should be encouraged to hang up their coats etc. and seat themselves in preparation for the school day. Dogs (or other animals) are not allowed inside the school gates. Smoking inside the school gate is prohibited by law. Aggressive behaviour or angry confrontations will not be tolerated. Parents engaging in such behaviour will be asked to leave the premises and sanctions will be put in place if necessary. Parents/Guardians should not take their children out of class prior to school closing time unless for a medical appointment or a family emergency. Please mark all items of clothing with your son’s name. 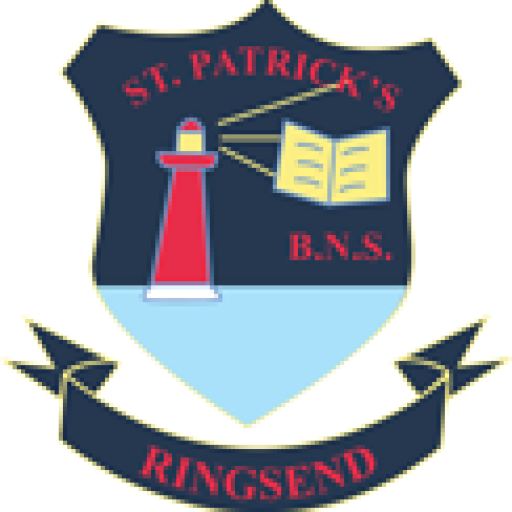 St Patrick’s BNS Ringsend is a primary school providing primary education to pupils from Junior Infants to Sixth Class. In accordance with the requirements of the Children First Act 2015, Children First: National Guidance for the Protection and Welfare of Children 2017, the Child Protection Procedures for Primary and Post Primary Schools 2017 and Tusla Guidance on the preparation of Child Safeguarding Statements, the Board of Management of St Patrick’s BNS has agreed the Child Safeguarding Statement set out in this document. In this school the Board has appointed the abovenamed DLP as the “relevant person” (as defined in the Children First Act 2015) to be the first point of contact in respect of the s child safeguarding statement. This Child Safeguarding Statement was adopted by the Board of Management in February 2018. Has the Board received a Principal’s Child Protection Oversight Report at each Board meeting held since the last review was undertaken? Since the Board’s last review, was the Board informed of any child protection reports made to Tusla/An Garda Síochána by the DLP? Since the Board’s last review, was the Board informed of any cases where the DLP sought advice from Tusla/and as a result of this advice, no report to the HSE was made? By enrolling in and attending, St Patrick’s BNS Ringsend you acknowledge that your personal data (including special category personal data) shall be processed by St Patrick’s BNS Ringsend. This Privacy Notice gives you some helpful information about which personal data we collect about you, why, who we share it with and why, how long we keep it, and your rights. When you are a student with St Patrick’s BNS Ringsend we collect and use your personal data. The personal data we collect can include information about your identity and contact details; images/photo (possibly including CCTV); family details; admission/enrolment details; previous schools; academic progress; PPS number; special educational needs; nationality; language; religion; medical data; information about behaviour and attendance; information about health, safety and welfare; financial information (re fees, grants, scholarships etc); and other personal data. Further details of the data we collect about you can be found in our Data Protection Policy. If you are under 18 years when you enrol, we collect the name, address, contact details and other information about your parents/guardians. If you are under 18 years, your parent/guardian is consulted and asked to give consent for certain things like taking your photograph, going on school trips etc. to process appeals, resolve disputes, and defend litigation etc. We share your personal data with third parties, including other Government bodies. This includes the State Examinations Commission, the Department of Education and Skills, NCSE, TUSLA, An Garda Síochána, HSE, the Department of Social Protection, the Revenue Commissioners etc. The level of sharing and the nature of what is shared depend on various factors. The Government bodies to which we transfer your personal data will use your personal data for their own purposes (including: to verify other information they already hold about you, etc) and they may aggregate it with other information they already hold about you and your family. We also share your personal data with other third parties including our insurance company and other service providers (including IT providers, security providers, legal advisors etc), We are legally required to provide certain records relating to the progress of a student (under 18 years) in his/her education to the student’s parents/guardians, including results of examinations. For further information on who we share your data with, when and in what circumstances, and why, please see our Data Protection Policy. We do not transfer your personal data to a third country or international organisation. Some personal data is only kept for a short period (e.g. We will destroy at the end of an academic year because it is no longer needed). Some data we retain for a longer period (e.g. retained after you leave or otherwise finish your studies here. For further information on the retention periods, please see our Data Protection Policy. Right to complain to supervisory authority. Right to object and automated decision making/profiling. Contact: If you would like to discuss anything in this privacy notice, please contact the school at ringsendbns@gmail.com. This document records the findings of this self-evaluation, and our current improvement plan, including targets and the actions we will implement to meet the targets. Domain: Learner Outcomes: Pupils demonstrate the knowledge, skills and understanding required by the Primary Curriculum. We focussed on two Learner Outcomes from The Primary Language Curriculum in relation to Reading Comprehension and looked at them on a whole-school basis. (8. Recall, discuss and sequence significant details and identify key points of information in texts. And: 9. Use a range of comprehension strategies to engage with and create meaning when working with a range of texts/ Draw on a repertoire of comprehension strategies flexibly and interchangeably to engage with the text). St Patrick’s BNS is an Urban DEIS Band 1 vertical primary school catering for boys from Junior Infants to 6th Class. We have 6 mainstream classroom teachers, 3 SE Teachers and an administrative principal. All teachers work collaboratively to plan and deliver a targeted, differentiated curriculum to our pupils. We have 132 pupils enrolled in the school at present. We have a shared HSCL teacher and participate in the School Completion Programme. We looked at the Review Instruments for DEIS schools and on reflection, we felt as a staff that we are doing a lot of things well in relation to Literacy teaching and that, in general, the pupils and parents are happy. We felt that our strengths outweighed our weaknesses but found areas where there was room for growth, development and improvement. Pupils’ subject-specific skills and attitudes are developed in accordance with the Primary School Curriculum. The pupils’ knowledge, skills and understanding for the specific subjects of the curriculum are at a good standard in accordance with the objectives, skills and concepts of the Primary School Curriculum. The overall attainment of the pupils is improving or is at a good standard in accordance with the objectives and skills of the Primary School Curriculum. All pupils have a very good base foundation to build on from book handling skills, Left-Right orientation, effective teaching of all sounds, blending sounds and phonics, use of Aistear, good base of common sight words, fluency progress due to individual readers, appropriate level of text, word ID strategies. Introduction of Accelerated Reading from 2nd – 6th class has had a positive effect on attitudes to reading as well as providing data on reading attainment. Employment of SE Teachers in classroom for Reading stations, small group work, and differentiated/team-teaching is seen as a positive development. All pupils use individual readers to progress at their own level and pace. Use of First Steps Literacy Programme. The majority of parents believe their son to be a confident reader. The vast majority of pupils enjoy reading. Our Micra-T standardised test scores were at or close to normal distribution levels. Teacher discussions, observations, assessments, reflection sheets and questionnaires. Pupil survey and focus group. Discrete teaching of Reading Comprehension strategies at all class levels. Teachers to upskill where necessary on teaching of Reading Comprehension strategies appropriate to their class level. Monitoring and assessment of progress and setting of SMART targets in relation to the teaching of Reading Comprehension strategies in our school. Increasing pupil confidence and success rates in relation to reading comprehension. · 3 boys from each class to be tested in York Assessment of Reading Comprehension for future monitoring (1 struggling, 1 average and 1 able student). Principal and teachers. · Scores to be compared each year to measure improvement. · Teachers to avail of CPD/upskill in the area of Reading comprehension with particular focus on Building Bridges of Understanding. · Teachers to engage with ‘Guiding Readers: Layers of Meaning’, ‘Comprehension: Beyond Literal Meaning’ and ‘Guiding Comprehension; Teaching for Meaning’. · Teachers to record Drumcondra Reading Profile scores for each child at end of academic year. All teachers. · Teacher feedback. · Pupils can use a range of comprehension strategies to engage with and create meaning when working with a range of texts independently or collaboratively. · Pupils can draw on a repertoire of comprehension strategies flexibly and interchangeably to engage with the text. · Discrete teaching of Reading Comprehension to be introduced at all class levels using the Building Bridges of Understanding Programme. All teachers. · Principal to ensure all classes are compliant. · Suitable books to be purchased for use with Building Bridges programme. Principal and Deputy. · Principal to oversee purchases. · Continuation of CPD with DP or Principal to undertake a course in Reading Comprehension. · DP to undergo training in Reading Recovery in order to help struggling readers. Principal and Deputy · Feedback to staff. · DP to take children for Reading Recovery lessons once course is completed. · Use of SE Team in planned small group teaching of Comprehension strategies. All teachers. · Teacher feedback. · PDST support to be sought if needed. · Pupils to be surveyed again to see if attitudes and opinions have changed. Principal and Deputy · Teacher and Pupil feedback. · Continued implementation of all new initiatives. · Further training or upskilling as deemed necessary. · Continued testing and assessments to be carried out and analysed to measure success. All teachers. · Teacher feedback and test scores from AR and Micra-T.
· Pupils from 2nd to 6th to improve their testing accuracy and speed of progression through Accelerated Reading ZPD. · Pupils and parents to be surveyed again to see if attitudes and opinions have changed. Principal and Deputy. · Feedback.